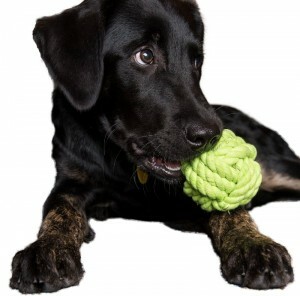 In this article we will be looking at the best puppy toys for your young dog. Puppies love toys. But every breed is different, and what can be the best toy for one puppy might not suit another as well. Depending upon the nature of your pup’s background he might be the most interested in toys for fetching, or tugging, or chasing. She might be most happy chewing, running, digging or sniffing. The best puppy toys will be those which suit your dog’s individual requirements, but that are also good quality, long lasting and provide ongoing entertainment to your pup. They also need to be within your budget, and fairly easy to get hold of. 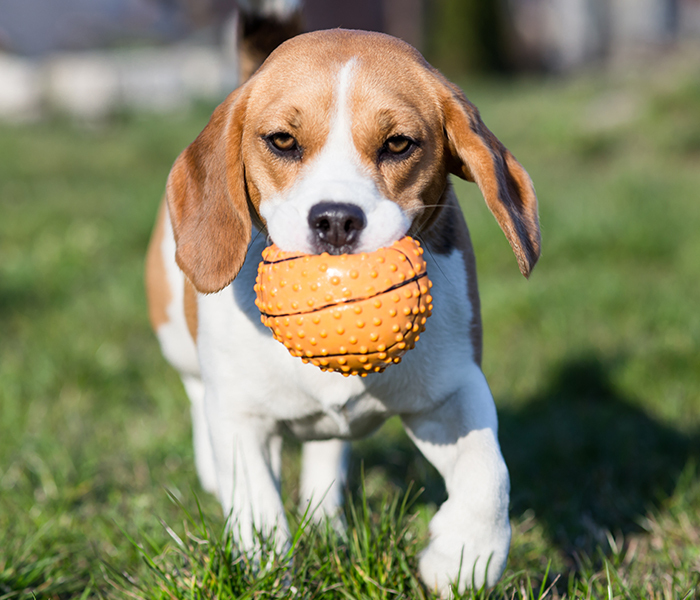 Your dog’s individual play needs will depend on him as a personality. Gundog breeds tend to be enthusiastic chewers from a young age, keen on fetching and very motivated by interactive toys. Hounds tend to love chasing, carrying and running, and most terriers are very focussed on digging and tugging. Some pups will happily cuddle in bed with a plush toy, whilst others will tear it to shreds in seconds flat. But even within breeds puppies will play in varying manners. So you can have fun experimenting with new toys, to see which your pup prefers. Whatever your puppy’s preference for play there will be a toy out there that he will love. 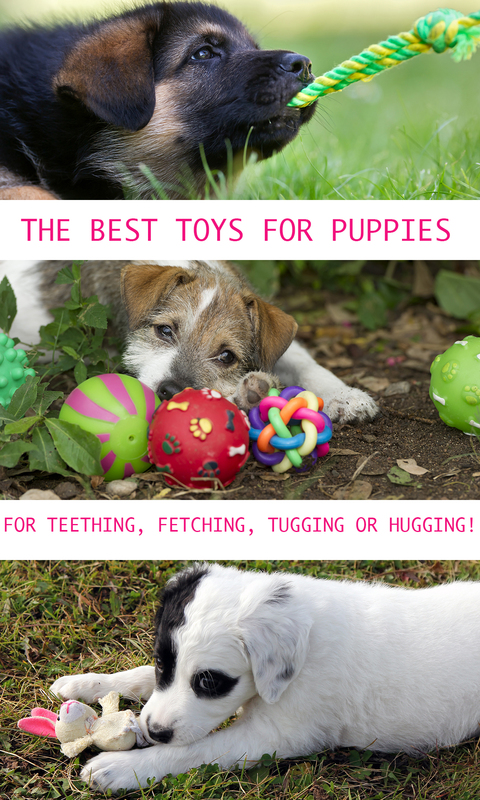 We have taken time to consider all the different types of puppy play, to help you pick a toy which will be perfect for your little friend. At The Happy Puppy Site we have had a few breeds of dog over the years, and have tried and tested a lot of different puppy toys. Not all of the toys we will look at today have been personally tested by our pups, but where they have we will let you know that they come with a personal recommendation from The Happy Puppy Site team. 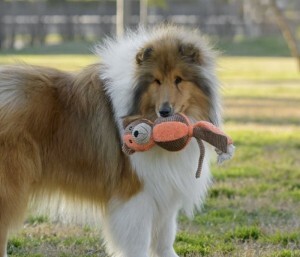 [wp_ad_camp_2]Good toys for puppies will have a high play value. They will be entertaining, fun and appeal to one or more of her natural instincts. Whether this is to chew, to chase, to tug or to fetch. Or even to eat in the case of many interactive puppy toys. They will also be durable, able to withstand a puppy’s sharp teeth and claws for a prolonged period of time. Good puppy toys also need to be safe. Before you buy a toy for your puppy, you can check on the label or description online to see whether it has been safety tested. An important aspect of this is to check whether your desired dog toy is appropriate for your puppy’s age group and size. A large breed puppy at 6 months could potentially choke on a puppy toy designed for toy breed puppies of 8 – 10 weeks. Make sure that you are picking a toy that is appropriate for your individual dog. There are some fabulous puzzle toys for dogs, but many of these require the dog to be a certain size and strength to use them effectively. So you need to be careful when picking one for your new puppy. Especially if she is from a toy breed group. Nina Ottosson has some fabulous dog puzzle toys to choose from, and there is one in particular which is great for pups of any age. The Interactive Brick Toy. 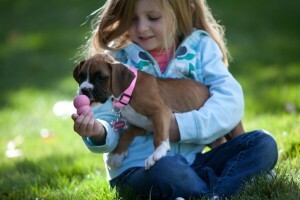 It is tailored to your dog’s own capabilities, so you can use the easiest setting for your new puppy. Suitable for all ages and sizes, this really is a great toy to keep your clever little pup busy and happy. It also have the benefit of being dishwasher proof, so you can keep it clean and drool free between uses. The Kong Puppy Activity Ball is a great interactive puppy toy. 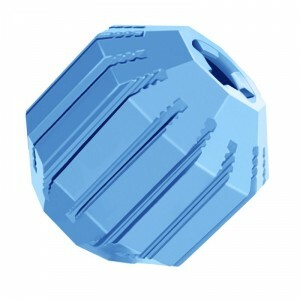 This ball is covered in grooves which you can fill with paste or insert treats into. 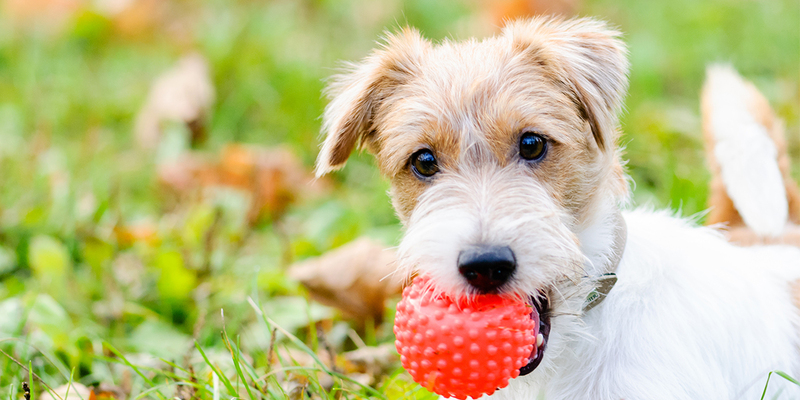 Your puppy can then enjoy chasing it around, and trying to nibble the treats whilst getting some exercise too. A fun way to keep a puppy’s busy mind and body entertained. The ball is designed for use by young puppies, and comes in two sizes so that you can choose the one most appropriate to your breed of dog. Puppy teething toys are an essential for most puppy parents. When your puppy is teething he will probably have an increased tendency to chew your home and bite your family members. 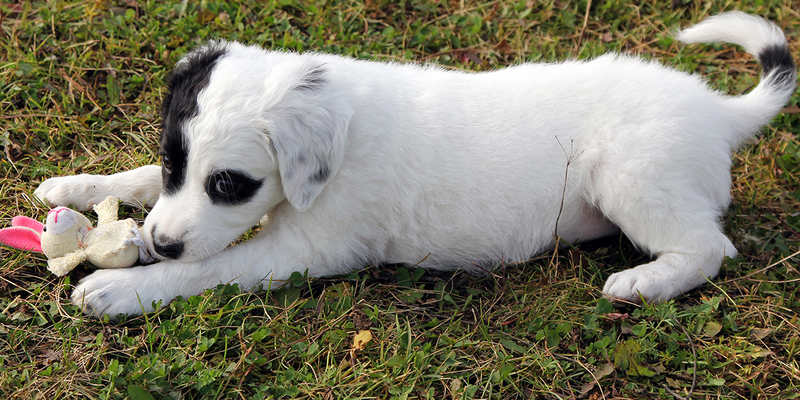 You can find out all about what to expect when your puppy is teething in this online guide. Your puppy’s teething period will be far more pleasant for him and for your family if you have the right toys to distract him with. When it comes to chew toys for puppies, we are big fans of the Kong brand. They are especially great for teething puppies. 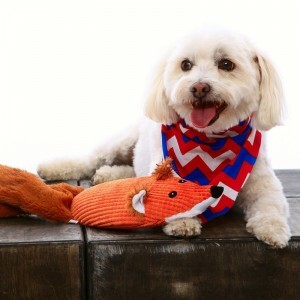 They have a line of enduring, well planned and fabulously executed chew toys and treating toys for puppies and dogs. Puppy kongs are perfectly designed for puppies who love to chew. They can be used by themselves as chew toys, or filled with kibble or special kong fillers. Keeping your puppy occupied when he’s on his own or in his crate for a short spell. We can personally recommend puppy Kongs, as our pups loved them. They are made with puppies in mind, and come in a variety of sizes so that you can pick the one best suited to your breed. They also come in different colours, so you can choose the one which you like the best. The Kong Puppy Teething Stick is specially designed to soothe your puppy’s sore gums as he chews. It also promotes dental hygiene by gently cleaning their teeth. 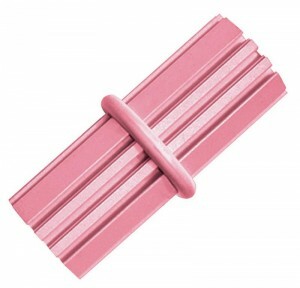 This chew stick comes in a range of three sizes and has two colour options too. It is perhaps best used by fairly young teething puppies, as some reviews suggest it can’t withstand the aggressive chewing of older or larger dogs. Find out more about the Kong Puppy Teething Stick on Amazon here. It gives your teething puppy something extra to chew on in the form of the ring. And is made of a tough durable rubber that will withstand your young puppy’s most vigorous chewing. 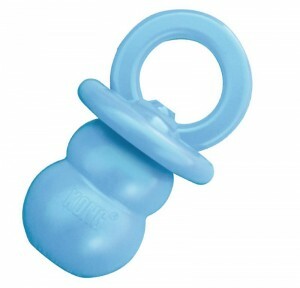 The Kong Binkie Dog Toy comes in three different colours, and two different sizes. Choose your size based on your puppy’s weight to find the right one for him. 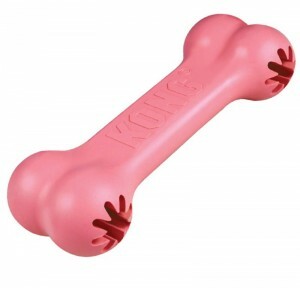 The Small Puppy Goodie Bone is a bone shaped dog chew toy with a twist. Not only is it made of a natural rubber which is ideal for teething pups, but it is recommended by Veterinarians for healthy teething. Each end of the Small Puppy Goodie Bone has a space to hold treats, which will help to get your puppy interested in chewing the bone and focussing his teething energies onto it. It’s recommended for puppies aged two to nine months, so you can give it to him from the day he arrives home at 8 weeks old. Whilst Kong toys are great, there are also some other excellent options from other brands and manufacturers too. The Mavel Rope Bear is a great puppy teething toy. It is designed with teething puppies in mind. It is a soft toy in part, covered in a gentle layer of lambs wool that is great for your puppy to snuggle up to. But it has inside it layers of strong, sturdy, durable material. Ideal for teething pups to gnaw upon. The fact that it’s braided rope is ball shaped also enables you to throw it for your pup, to really get him interested in it as a toy to chase and then chew. The Nylabone Just For Puppies Teething Ring is shaped and styled much like a baby’s teething ring, and is designed to encourage your puppy to chew easily, so that they use the ring and not your furniture! It has a soft material finish which is kind to your pup’s sore gums. And raised bristles that promote teeth cleaning and could reduce the buildup of tartar. The range of shapes are hoped to entertain your puppy, and give him some options of the shape which is most appealing or comfortable to chew upon. They are specially designed for teething puppies, so be sure to remove the toy once your pup has his strong adult teeth. 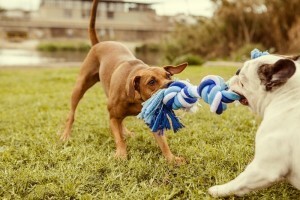 Most breeds of puppies love to play tug. Especially those in the Terrier or Gundog family groups. Having the right tug toys for puppies is important, because you don’t want to damage their tiny teeth or make it impossible for their small mouths to get a good hold. Rope toys are a very popular option, and all of our puppies have had puppy rope toys to play with. They aren’t just great for playing a gentle game of tug, they can also be carried around and chewed as well. For more aggressively chewing breeds, even in puppyhood standard toys can be broken down very quickly. Ropes are fairly hardy but not indestructible. You will need to watch your puppy to see whether she is playing gently with her rope toy alone or whether she is determined to pull it apart. If she seems to be dismantling the rope, then limit her time with it. Not only will just taking the rope out at play time reduce the wear and tear, but it will make your puppy highly value the one-on-one tug time with you as well. Increasing your bond and giving you both something to enjoy together. A great alternative to the traditional knotted rope puppy toy is the Puppy Goodie Bone. It consists of a rubber bone shaped chew toy, with a rope component attached. 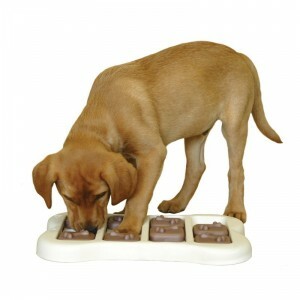 Your dog can hold onto one side whilst you gently play tugging games holding onto the other. They can choose whether it’s the bone or the rope that they prefer to grip onto. It comes in a range of sizes, the smallest being suitable even to teacup breed pups. The Ethical Pets Lil Spots Rubber Bone is a puppy tug toy and teething toy in one. It contains a soft rubber bone with raised ridges for chewing, and a short knotted rope for pulling. You can hold the rope and allow your puppy to gently tug on the chew toy in your hand, or just leave him to entertain himself. Best suited to smaller breed puppies, this little toy is light and easy to carry. It’s also the perfect size to chew on for small puppy mouths. You can find out more about this tugging chew toy on Amazon here. Plush puppy toys are lovely things, but picking the right one for your pup can be a minefield. The most cute puppy toys are not necessarily the best for your tiny dog. Most puppies love plush puppy toys, but they don’t always treat them in the manner we would like. We imagine our pups cuddling up to their stuffed friends, yet more often than not they will shake, squeeze, rip and tear them to shreds! Fortunately, there are a few options when it comes to cuddly toys. Some are only suited to the snugglier puppy, others are designed with stuffing removers in mind. Make your pick based on what you know about your puppy, or err on the side of caution and go with the sturdiest choice if you are on a budget and can’t afford to get it wrong! 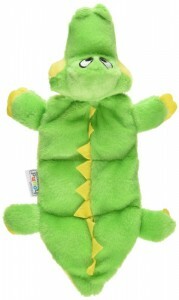 The Matz Gator is great fun for pups, with noisy squeakers dispersed around his body and a rattle in his head. It can be shaken or squeezed, and flaps around as your puppy plays. The alligator himself is also soft, so your puppy can cuddle him if he prefers. Best suited to minor to moderately enthusiastic chewers, the Matz Gator toy can be enjoyed by puppies of any size or age as it comes in a range of sizes. The smallest has just a few squeakers, the largest is long and has 32 squeakers in total! For most pups under 12 weeks the smallest is the most appropriate option. Our Labradors are particular fans of the Ethical Plush Skineez dog toys. 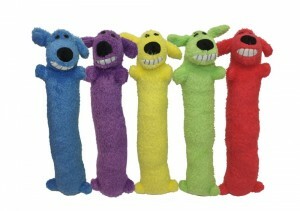 These are one of our recommended range of puppy toys. They don’t contain any body stuffing, so can’t be easily dismantled in the way that some plush puppy toys are. They do contain a squeaker in the head, but so far even our intensely chewing Lab hasn’t been managed to remove hers so you are onto a safe bet with a young pup. The lack of stuffing also makes them light and easy for a puppy to carry around with him. Loofa Dog Plushes are very cute dog toys. Long and straight with a dog’s head on the end, they are perfect for carrying around and have a squeaker to keep your pup entertained. They should be suited to any sized breed, although you may find that tea cup puppies are not able to lift it when they first arrive with you. If your puppy is a very aggressive chewer or stuffing remover this might not be the best choice, but they are ideal for minor chewers and puppies who love to carry their toys and play with sounds. The Pheenx Foxy Plush Squeaker Puppy toy has a real character to it. It is easily compressed, and can be mouthed by any size of dog. Making it great for even young puppies to handle and play with. The built in squeaker is entertaining, and the shape enables your puppy to play with it in a variety of ways. It can also be used to play fetch, or simply for your pup to cuddle up to in bed. Lots of puppies love to play fetch, especially those from the Gundog breeds whose ancestors were selectively bred for their desire to retrieve. But a lot of fun adult dog retrieving toys are not suited to puppies, due to their large size or heavy weight. We have selected some fetch toys for puppies which will be appropriate for most breeds, and which they can play with from the time they arrive home at 8 weeks old. The Kong Puppy Flyer is a fantastic fetch toy for puppies. It is made in a traditional frisbee shape, but comprised of an extremely durable natural rubber. The disc is flexible and fun to throw for your puppy, or for them to run around and play with. 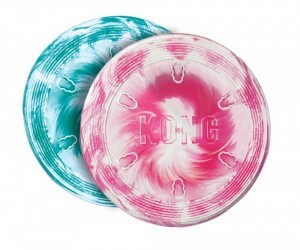 The Kong Puppy Flyer is 7 inches in diameter and has a width that is perfectly suited to a small puppy’s mouth. This toy can be played with by puppies up to 35 pounds in weight, so smaller breed pups will get more use out of it than their larger friends. Fabulous exercise for your puppy, and great fun for you both. 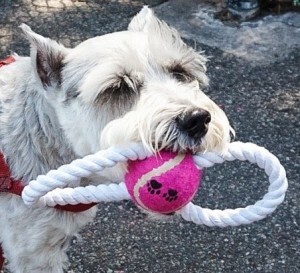 The Dog Rope Toy is a fun fetch toy designed for small dogs and puppies. Ideal for indoor or outdoor play, for dogs up to 30 pounds in weight. You can use the rope to play retrieving games with your puppy, as a fun tug toy or just let them carry it around and shake it about. The rope is 100% cotton, and easy for dogs to pick up. Remember though, this isn’t a chew toy for aggressive chewers or teething and could be dismantled. Best used for supervised play only. We love puppy rope balls for our pups. They are were all big fans and it’s a highly recommended toy by the Happy Puppy team. Unfortunately, it doesn’t appear the type we used when they were pups is available at the moment, but this one looks like a close match. It’s made of 100% cotton and safe for your dog to play with. The knotted rope ball is fun to chew as well as to fetch and carry around. It’s also brightly coloured so easy for you to find in the back yard. Ideal for medium to large puppies, or small to medium adult dogs. Cheap Puppy Toys – how do I save money and treat my pup? Be careful when looking for cheap puppy toys, because they can be a real false economy. Spending a small amount on a toy which will last five minutes will cost you more in the long run, as you will be constantly looking for new toys. Similarly, a cheap puppy toy which is of no interest to your puppy is essentially worthless, as buying it didn’t gain your dog any pleasure or distraction. The best way to find cheap puppy toys is to look for toys with great reviews that are being offered at a discounted rate. Or to ask your friends whose puppies have grown into large adult dogs, whether they have any puppy toys in a good condition which they would be happy to pass along to you. These are great suggestions for my little of 5 foster pit bull pupies! At 4 weeks old, they are starting to learn to run and play, and chew! Thanks for the wonderful advice! Hands down go with the Goughnut toys. We have the ring and sticks and our lab (as well as the pups in our service program we belong to) love them. They come with a lifetime….YES! I said LIFETIME guarantee! They are safe, and Labrador and Golden Retriever tested!! im fostering a hound dog and she chews like crazy!!! im definetly buying some of these! My husband and I just bought a little puppy. He is a lab, so he likes to chew a lot! My dad suggested just giving him old cardboard boxes. Although that would be cheap and easy, I’m worried he might choke on the small pieces and also make a mess. I will make sure to buy safe puppy toys like you suggested so that I can have peace of mind. Thanks!